Being a big fan of grassroots Drifting, alongside working for the European Importer of KAAZ LSD’s, it’s hard to ignore the fact my Car needs some help to get a little more sideways. Having been a 2x Year Veteran of driving my older project Cars with Locked Diffs, I decided it was time to treat my latest pride and Joy with a new KAAZ unit. The Car (a 1996 Toyota Chaser, Tourer V) comes well equipped, but only has an open Diff as standard, so not so good for Drifting. 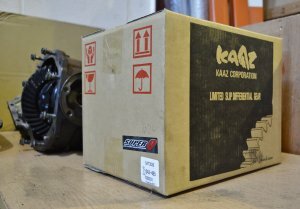 On the Shelf, we have a KAAZ 2-Way Super-Q unit, supplied with 2l of 80W-90 LSD Oil (SAT3030-WPC) which will do the job nicely. The Super-Q series of LSD’s feature Low Friction treated Plates, giving a quieter, smoother operation and reduce Plate ‘Chatter’ during operation. Ideal for those who use their Car on the Road still! Additionally, the Super-Q benefits from Improved Heat Dissipation, Longer Wear life and also no requirement to Break-In the LSD when installed for the first time, unlike the Standard KAAZ Units. 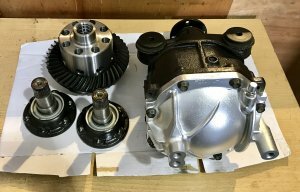 All these features, along with the ability to modify the locking ratios to your preferred specification, means the Super-Q is a brilliant all rounder for those who want that Competition Spec Differential, without sacrificing the comfort of a road Car. It’s worth noting, if you are using it for street or daily driving use, KAAZ recommend a 60% – 80% locking engagement. 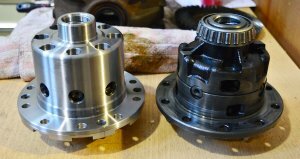 But if your vehicle is used for weekend competitions or fast road/sporty driving, then the full 100% engagement is ideal to get the most from your LSD. As I will be using mine for Street and Drift, I opted to leave the LSD at its factory 100% setting. 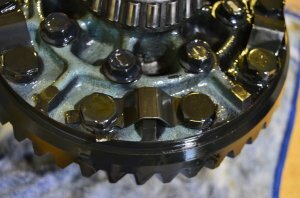 From the Standard Diff, we next need to remove the Crown wheel. 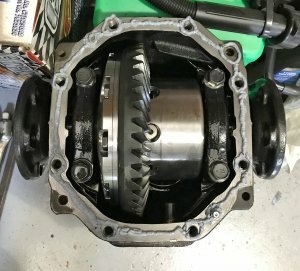 To do this, it’s a simple case of bending back the locking tabs, removing the factory bolts and then tapping the Crown wheel off. 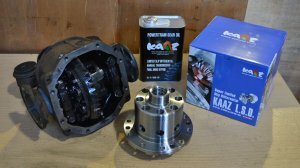 For fitting the Crown wheel to the KAAZ LSD, we simply re-use the Factory Crown wheel bolts and Torque up to the Factory Settings. 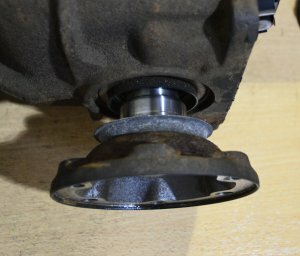 Worth noting, the Factory Bolt locking Tabs cannot be used on the KAAZ LSD, so we decided to use some thread locking solution when tightening the bolts back up. 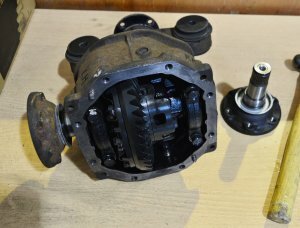 Next step, we gave the diff case a good clean, fresh lick of paint and installed new Driveshaft Seals. 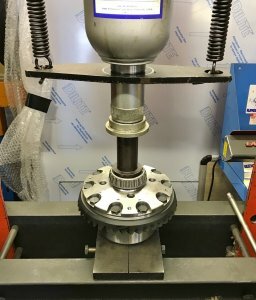 The final steps of the install, leaves us to bolt the unit back in and check the pre-load settings as per the Workshop Manual. 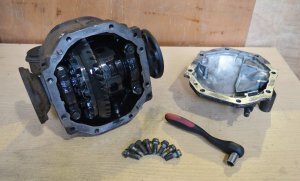 Once complete, the Driveshaft stub axles were tapped back in and the Diff Cover Sealed back up ready to fit back onto the Car. So far, the Car has been great to drive daily on the road. 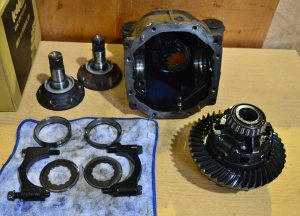 The Diff has exceeded my expectations and is very easy to live with. I am looking forward to seeing how well it performs on the next drift day! For sure Oakywood is a unique company. It makes objects from high quality wood. 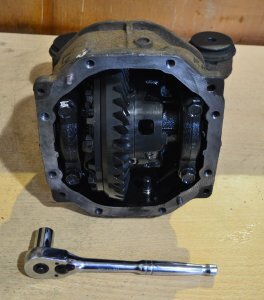 Its products are of high quality, and customers derive satisfaction from unique items. Our e-commerce agency helps companies selling online products. Online shops are looking for excellent support.